Topics: Properties, Reciprocity, Buying, Selling, and Winnipeg Info. ns2.myrealpage.com, and ns1.myrealpage.com are its DNS Nameservers. It is hosted by Bell Canada (British Columbia, Vancouver,) using Apache/2 web server. 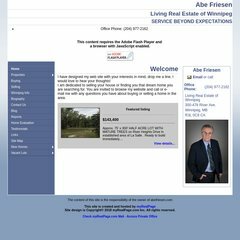 Abefriesen.com's IP address is 64.42.222.57.